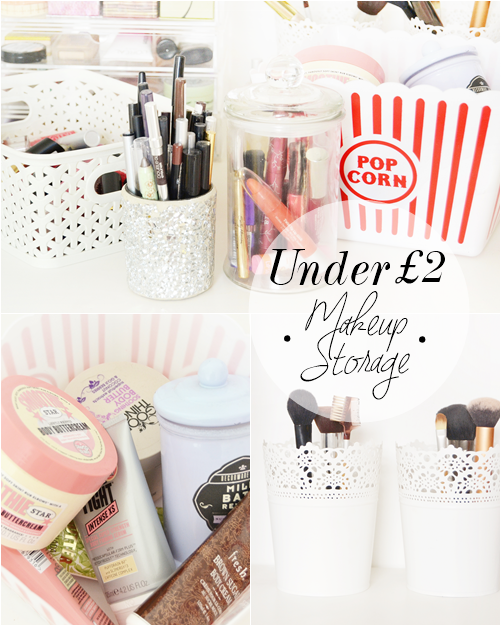 When it comes to storing makeup it's easy to think quality storage means ££. However over the years with my own ever expanding collection I've discovered you can find storage solutions in the most unlikely of places and getting creative really can save you money! 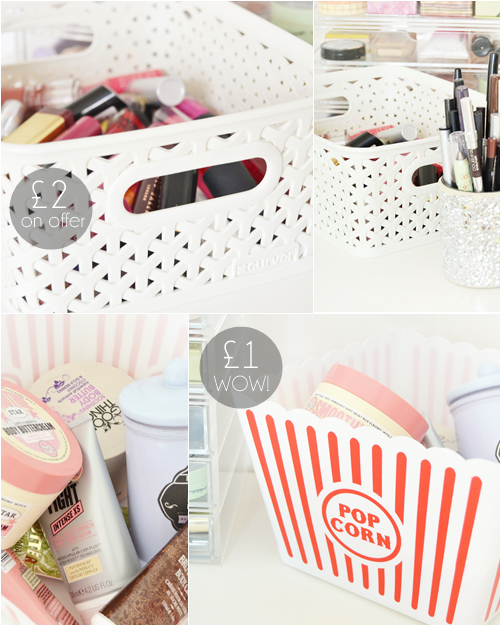 So here are 5 storage solutions I love that are all under £2 - pretty amazing right? First up a strong rigid storage box that would be ideal for body/bath products or even storing makeup in. The style of these would look great on a shelf as a pair or trio to separate makeup in categories. I will be making good use out of this storage box by storing all my hair products in it and keeping it next to my hair tools. The My Style range also consists of medium and large boxes, in both cream and brow, at very reasonable prices. This is maybe my most favourite storage option as it so fun and ideal for keeping large body products in. For only £1 the detail of the storage bucket/box is impressive with the scallop edging making it look a lot more expensive that what it is. On a desk, shelf or in your bathroom this is bound to look great! 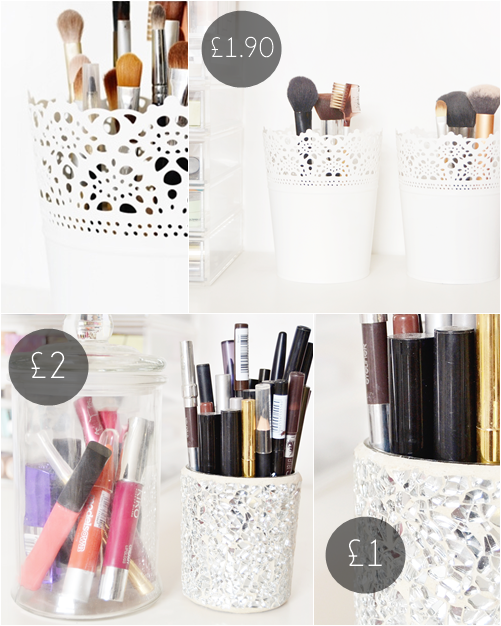 For the past year or so I've been using these wonderful Ikea plant pots to store my makeup brushes in and still love this storage solution idea. For only £1.90 each the metal plant pots are amazing quality and quite large in size. To make all my brushes stand up I've simply fill the pots half way up with uncooked rice. A simple storage solution that's practical and looks great. A simply idea for storing lipgloss', lip crayons, mascaras and eyeliners is housing them in jars. These can be recycled jars, Kilner jars or even sweets jars like the one above. Pinterest is awash with ideas of how to jazz them up and even paint the inside of them. Around my makeup room I have numerous candle holders to store anything from eyeliners to nail art brushes in. Candle holders are generally inexpensive yet decorative and look great on all surfaces. Highly recommend looking in Tesco, Primark and Home Bargains. Hopefully this has given you a few new storage ideas and shown that you can find pretty looking storage on the smallest of budgets!